Trully quality boot Good transaction,fast shipment and free at that. Will buy again. Excellent Boot! High end leather So the boot feels great within a couple hrs. Definitely will order a second pair! 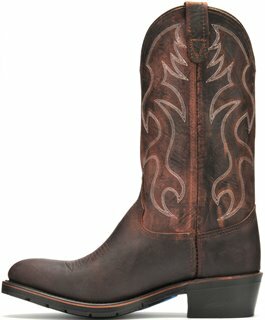 My son just loves these cowboy boots for work and play. I am so happy I found this website to order from. These boots are the BEST!!! Awesome service. Great and fast service, I would recommend this site to anyone. I have the worst feet in the world , 8.5 with a 4e on one side and a 3e on the other. Have never found shoe to fit me other than slippers or sneakers. I work in the trades and need boots to wear that are comfortable. Not only do these boots fit the bill, I got them in just 2 days with regular shipping. my husband loves these boots. he had his first pair for nearly 7 years and he needed an updated pair. he never wants a different brand other than Double H! very happy. Thank you. These boots quickly became my favorite boot. They are a comfortable and very sturdy boot. If you want a boot that can handle tough wear this is it. The only boots I wear every day, work and play. Best boots I have ever owed. Very good customer service and the boots fits great. This is my third pair of these boots. The last pair I still wear. I'm on my 3rd heel replacement. They feel good and last for years. Love these boots. The only kind I own. The Double H, AG7™ Work Western 3282, fit almost perfect from the moment I tried them on, I thought something was wrong, they were just too comfortable, right from the box! I love these boots. Weeks later, on the job, a dusty/muddy construction site, they still feel great on my feet. They look good enough to wear out on the town, too. I highly recommend these boots! Great service, great fit, no complaints. I am on my second pair of these in black. After 10 years of abuse my first pair was looking pretty rough and I needed to replace the heels. This pair of brown ones I bought for my brother for Christmas. He is happy with them and they look great. These are great boots. Strangers come up to me and comment on what great boots these are. I was very pleased with the prompt service to exchange the boot to a size that fit and promptly credit my credit card with the return. Took almost 6 years to wear the soles out wearing them everyday for work. Boots arrived quickly. They called to make sure that it was shipping to the correct address since my bill to and ship to were different. I am about to purchase my second set of double H boots. The first pair bought 5 years ago has been the best boots I have ever owned. Thanks double H.
I have been wearing double H Work boot for over 15 years . I have not had any trouble with the boot not fitting corect. And i have not had to ever send a pair back. Thanks double H The quality is very good. I bought a pair of Double H boots about 12 years ago. They have out lasted two pair of other brands and are still not worn out. The DRYZ footbed which my first pair had makes them very comfortable for all day wear. 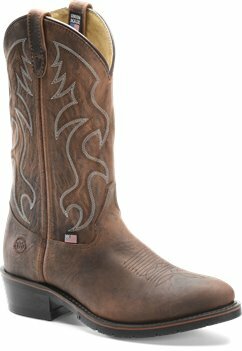 My son wears nothing but this boot 24/7 and he is a professional in Carson City Nevada...he loves the comfort and feel I hate the unshined looked but its the one that fits him the best...so he gets a couple pair a year. The boot was fine I just ordered the wrong size. But I will never do business with shoeline.com again. I have never had so much trouble getting an order in my life. They ignored my emails and were incompetent on the phone. I returned the boots for a refund and refuse to even consider ordering again. New shoes are always a little snug until you break them in. They look good and will be comfortable in tops two weeks. I will continue to be a DoubleH buyer. I had felt that the boots were a little tight especially the right boot. I actually had to take the insole out of the boot to get my foot inside of it but I did wear it like that for a couple of days. When the boot got broken in and I could put the insole back inside they still feel a little tight but not enough to make my feet hurt or get blisters on my heel. Im sure the boots will break in just fine after I have worn them full time and if they are anything like the steel toe version they will last many years. Shipping was fast and it was easy to get them on-line. I love the boots. Unfortunately I can’’t get any to fit me correctly. I tried on sizes larger and smaller at a local boot store and bought the in between size online at Shoeline. They were too big. In my attempt to get fitment assistance from Shoeline I was told the only thing they had were these reviews. As a result I am sending the boots back and will not be going back to Shoeline for anything again. These are great boots. I owned two pairs before and they lasted 6-7 years wearing them everyday. I was glad I was able to find them on your website. In the Double H website this boot was described as leather lined WHICH it is NOT But because I need these now and didn’’t want expense of shipping back and long wait and trying to find something else to buy that is leather lined I am keeping these but will never buy this way again.